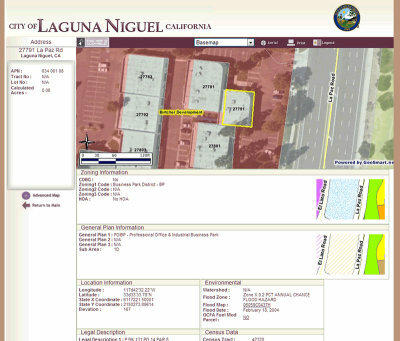 GeoSmart.net is the fast, easy, and powerful application development environment for web-based Enterprise GIS. Non-programmers can easily create and maintain sophisticated web applications using the GeoSmart.net Management Portal. Web and GIS developers can use the robust components and API included with GeoSmart.net Enterprise Edition to enhance and extend the functionality of any GeoSmart.net application. Whether you are a GIS Manager or an Advanced Web Developer, GeoSmart.net empowers you to develop applications in hours and days, not weeks and months reducing costs and increasing your ROI. 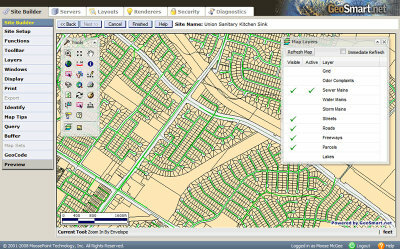 Version 5.2 of GeoSmart.net for ArcIMS 10.0 is now available to registered customers using GeoSmart.net. Road Work AheadTM is the latest addition to the collection of Smart Solutions. 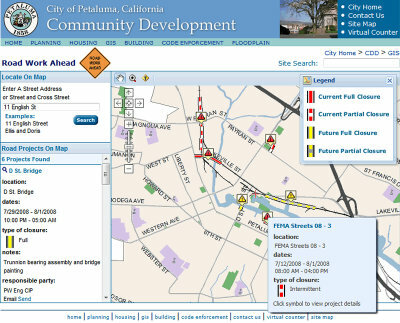 The three applications that comprise Road Work AheadTM allow an agency to publish real-time updates about planned projects that affect road conditions. Be sure to view our Smart Solutions page to see how GeoSmart.net is utilized by MoosePoint Technology, our clients and our partners. To see what's new with GeoSmart.net and view some of the many organizations who have chosen GeoSmart.net as the solution for their application needs, visit our News section. Not sure what it takes to host your data and applications? Want to avoid the hassles of building your own server farm? From single applications to full enterprise-wide GIS, we can accomodate all your needs in a new, state-of-the-art data center. Check out our hosting solutions. Need more information regarding GeoSmart.net? Contact us.